So How DOES a Grandma Dress? When I told one of my twenty-something son a few months back, that he was peppering his sentences with the f-word so much that it was annoying and meaningless (inferring that I use said word only when called for) he told me, I didn’t understand the way today’s youth communicates. And when I told my twenty-year-old daughter it was weird for her to call her female friend, “Dude”, she informed me that I had no understanding of how her crew rolls. So I’m the one that needs to find a new personal steez. Flash forward a few months and despite the fact that I’ve heard that fifty is the new forty, (except that your back hurts in the morning and you read all the articles about botox) my journey to be more chillax with said youth has been complicated by my new status as a grandma. Suddenly it’s not cool for me to be cool. Take the other morning – my precious, adorable, gifted (how can she not be?) three- month-old granddaughter, who I love to absolute pieces, was bawling her beautiful eyes out. “Oh baby, baby, what are you bitching for baby?” I crooned, in the presence of above son, the uncle to the screeching infant. “Hey, I was joking,” I said to Mr. F-word. Okay, he’s a sensitive kid. But this grandparent image doesn’t end with my vocabulary. My poor husband wore a handsome new cardigan, instead of his usual sports jacket, to work on a casual Friday and not one, but two people joked that just because he was a grandpa, he didn’t need to dress like one. I zipped home, tore off the baggy jeans, pulled on the new tights, found the right black skirt and tee-shirt, added a black jacket (black is the new black) and stepped up to the mirror. I’m proud to be a grandma. 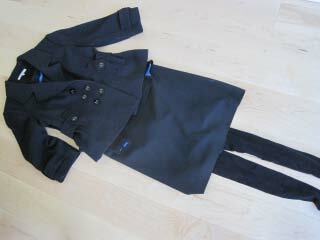 But my uniform for this fashion season which is devoted to the peg legged women, looked like that of a f-ing (sorry son) aging flight attendant. For reals. I’m afraid I don’t even know what steez means and when I asked my 27-year-old still at home, still going to University son (you know the one), he brushed me off with “I don’t know Mom, why don’t you ask Candy”. So, no help there. O.K., was just skyping with Em and she tells me it means style. Thank God I know something now. Despite my new job at a fashionable Women’s Wear store I also did not know about the no denim on denim rule. Stampede’s an exception, right? It’s okay – twenty-something son texted to tell me never to say chillax again, and same age daughter emailed to add – “You meant to use off the chain wrong on purpose, right?” Wrong. I still use that one if I even get the inkling that a comment on my attire might be coming. In comparison, teenagehood and adolescence were a breeze – how do we deal with this time of our lives? Seriously? Great post – I love the teenage slang – sounds so familiar! Just hope I got the slang right. Wow, EVERY SINGLE DAY, my 3 fashion frenzied kids comment on my style, or lack there of. As hard as they try to put me together I fight back. Just yesterday the comment was, “OMG mom, a Canadian tuxedo with some tie dye t-shirt with a stupid saying on it, really”, backed up by her other sibling, “Ya mom, you never do denim on denim. Shaking my head, I thought to myself, what does it matter what I wear to paint the trim on the house followed by walking the dog. I am loving your posts and I am glad that I am not alone on the runway. Hey, fun to see you here. No denim on denim, hey?